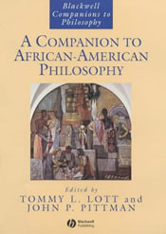 Editor/Author Lott, Tommy L. and Pittman, John P.
This wide-ranging, multidisciplinary collection of newly commissioned articles brings together distinguished voices in the field of Africana philosophy and African-American social and political thought. - Provides a comprehensive critical survey of African-American philosophical thought. - Collects wide-ranging, multidisciplinary, newly commissioned articles in one authoritative volume. - Serves as a benchmark work of reference for courses in philosophy, social and political thought, cultural studies, and African-American studies.